Scroll down and click on the following categories below for more information on our Standard Procedures. 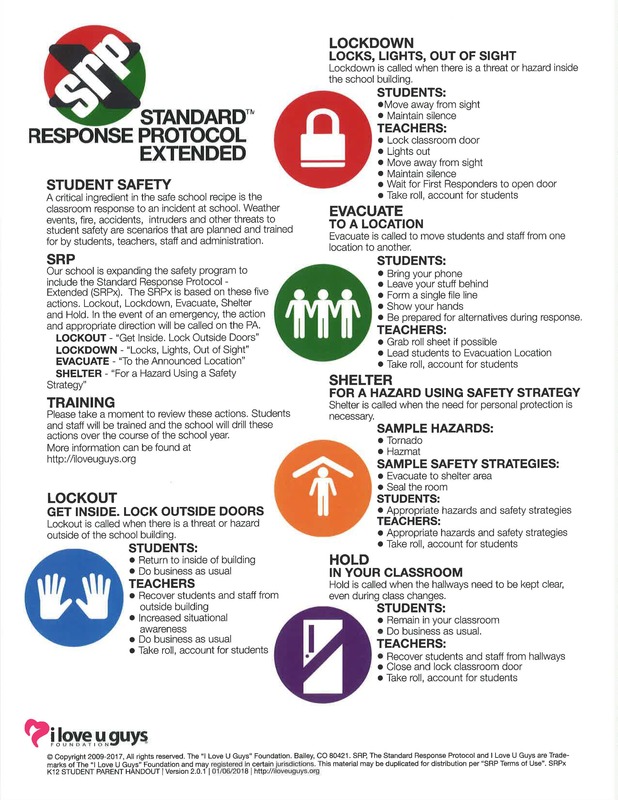 The following definitions come from the Emergency Classroom Guide, a red book that is hung in each classroom across the District and each school has been trained on these scenarios. Below the scenarios, you’ll find our Standard Response Protocol posted in each classroom. If you have specific questions regarding your schools procedures, please contact the school directly. If your child is in an emergency situation and you feel like you need more information, feel free to always call the District Offices at tel: 802-865-5332 or the Superintendent’s Office at tel: 802-864-8474. If a potential threat is suspected outside of a school building, notify the Main Office. Lock all exterior doors and windows (pull shades down). Terminate all outside activities. All staff and students that are outdoors must return to the building immediately. Teachers must take attendance. Report discrepancies to Main Office. Hold all persons, continue teaching as usual and wait for more specific instructions from the Main Office. Business as usual. Students in hallways, bathrooms or other common areas will return to their classroom. If the Clear-the-Halls is announced between class periods, students will return to their previous class to await instructions. If the route is blocked, students will go to the nearest classroom and advise the teacher that they are unable to get to class and await instructions. Remain in position, continue teaching as usual until further instruction is given, unless remaining in place compromises safety. Do not leave victim unattended. Call 911–Notify office of an emergency. Assist in First/AID/CPR only if trained to do so. Do not move the victim if possible. Control bleeding by applying direct pressure. Help prevent shock by keeping victim dry, calm, and warm, if possible. Check for medical alert tags. Remain calm. Exit building quickly and quietly, close all doors. Be alert for blocked exits and redirect students as necessary. Assemble in designated area. Staff without students must report to Incident Command Post. Take student attendance roster when exiting the building. Once outside, record attendance and note extra, missing, or injured students on form. Use your Red or Green card to help with accountability. Use Red if you are missing, have someone extra or injured person. Use Green if everyone is accounted for. Remain clear of all roadways. Await further instructions from Incident Command. The Fire Alarm is the Evacuation Signal. All staff and students must evacuate the building promptly. Remain calm. Exit building quickly and quietly, close all doors. Turn off lights. Be alert for blocked exits and redirect students as necessary. Assemble in designated area. Take student attendance in roster when exiting the building. Once outside, record attendance and note extra, missing, or injured students on the form. Use your Red or Green card to help with accountability. Use Red if you are missing, have someone extra or injured persons. Use Green if everyone is accounted for. All students will remain under direction & control of staff member. Remain with class. Be prepared to wait. Remain calm and reassuring. Do not speculate about the cause of the evacuation. Incident Command will advise staff of any change in locations. If given the order to relocate, follow the directive calmly and as a group. After any movement of students, staff must take attendance again and report any discrepancies to Incident Command. If a bomb threat is received or suspicious item seen, notify office. If a phone call, the school employee receiving the call should obtain as much information as possible from the caller, using the Bomb Threat Checklist as a basis for data inquiry. Upon termination of the call, use *57 to trace. Notify building administrator immediately. If the call is received by other than telephone, the building administrator is notified immediately. Written threat or objects: Do not disturb. Secure area. Staff & Students will remain in place, calm & quiet until threat assessment is completed by Incident Command. All staff/students that are outdoors must remain outside and report to outside assembly. Teachers to conduct visual inspection of classroom for suspicious items. Do not touch. Take attendance. Report unusual findings to Incident Command. There is no movement from classrooms at this time until directed by Incident Command. Person observing any imminent threat in school can initiate a lockdown. Lockdown Signal is to call out “Lockdown.” Anyone who hears the lockdown call echoes the call. The lockdown signal may come across the intercom. Immediately gather students from hallways into classrooms or offices. This includes common areas and restrooms immediately adjacent to classrooms. Classes outside are to remain outside in a safe area. Call 911 and report lockdown at the school. Take attendance of students in your room. Note any extra or missing students. Note last known location of missing students. Keep this record for when you are released from the lockdown. Be prepared to wait. Remain calm and reassuring. Do not speculate about the cause of the lockdown. Stay alert and ready to move if directed to do so, unless remaining in place compromises safety. Lockdown will end only when you are physically released from your room by emergency responders or other authority. Shelter is called when the need for personal protection is necessary. Training should also include spontaneous events such as tornado, earthquake or hazmat. PUBLIC ADDRESS: The public addresses for shelter should include the hazard and the safety strategy. The public address is repeated twice each time the public address is performed.